MICR (Magnetic Ink Character Recognition) is numeric nine digit bank code used to identify correctness of bank checks. MICR code is used special character recognition technology that helps in faster processing of cheques. MICR code not only used for correctness of check but also used for check processing. MICR consist with nine digit, the first three digits in the MICR code represent the city code, the next three give the bank code and the last three digits cover the branch of the bank. 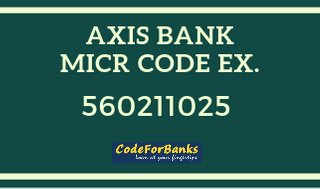 For example: Axis Bank Micr Code 560211025 Bangalore Bidadi. The first three digits representing the city code, the next three digits representing the bank code, the last three digits representing the bank branch code. The MICR code printed at the bottom of bank check with the help of magnetic ink. A special machine is used to read these characters, which can be easily read by humans too. Where you can Find the MICR Code? You can find the MICR code using Codeforbank.com's IFSC code located in Banks Code menu. The MICR code printed at the bottom of bank check or passbook with the help of magnetic ink. You can also find the MICR code on the bank's website.